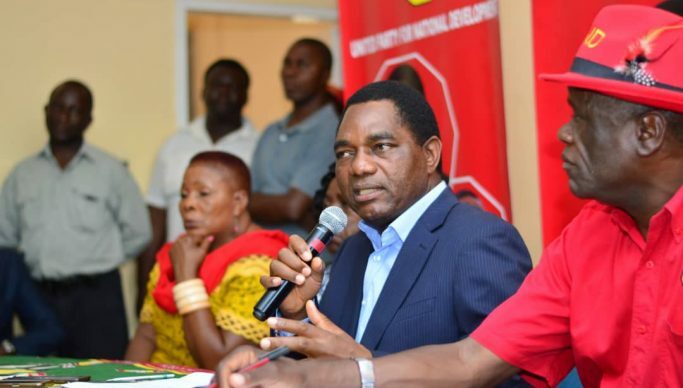 OPPOSITION United Party for National Development (UPND) president Hakainde Hichilema has disclosed that the meeting he held with president Edgar Lungu on Monday was polite, frank and open. Speaking during a press briefing at the party secretariat on Thursday, Hichilema said the meeting organized by the three Church mother bodies was a step further in the process of long awaited dialogue between the two parties to deal with many challenges affecting the people of Zambia. “The meeting was fruitful and I remain confident that fruits will be seen soon. For a period of time we have interpreted the issue of dialogue in many ways. For now, I can confirm with you that even those who have been delaying the process have agreed and accepted that we must talk to each other,” said Hichilema. He commended church leaders for taking serious obligations over the process. “We met and we talked to each other because we cannot continue living a luxury life in our homes anymore when citizens are hurting each other every day and am glad to say that the meeting was open. Both of us agreed that we must provide mature leadership and bring to an end this current political tension so that our country, our people can be productive,” he said. Hichilema added that the meeting also agreed that the dialogue process should not have any conditions and anything that is hurting the people of Zambia should be brought on the table. And Hichilema has commended the Zambian police for showing professionalism during his interrogation at Ndola central police on Tuesday. “I would like to thank our men and women in uniform all of them for a great job they did in terms of acting professionally, despite that the situation was extremely tense. Even if there were some few things here and there as you know when there is such a crowd, small issues are happening but the command on the Copperbelt this time around acted professionally. It’s not easy to contain such crowds of people,” he said. Hichilema has since called on the police to take professionalism forward in order to build confidence in Zambia police. Meanwhile, Hichilema also said that there was need for the country to have a free and fair elections and a violent free election in order for people to choose leaders of their choice. “There is need to create a peaceful environment where PF, MMD, UPND, NDC, PAC supporters wear their regalia freely without any intimidation from anyone.” he added. He said that an open electoral process allows people to understand and agree that election where free and fair rather than having secret rooms at the totaling centers of the elections results. “How can an election where people are fighting be free and fair, how can a district commissioner who is a civil servant campaign for a political party? Would you call that fair? No, and public money is being used openly during these elections and they are buying votes openly while the police are watching that is not free and fair,” he said. Hichilema said the country did not have a truly and independent electoral commission as some members had confirmed that they were having many challenges in dealing with electoral issues professionally. Hichilema also reiterated his resolve to protect national resources and parastatal companies in the interest of the majority Zambians. “We shall continue speaking for the people of Zambia and we are assuring you that all public asserts which were sold as UPND we will get back your asserts as it belongs to you Zambians, and this will happen very soon and it will be very soon,” he said.